The winter of 1774 was approaching its end, when a new fashion of hairdress made its appearance, and was baptized the Ques aco. 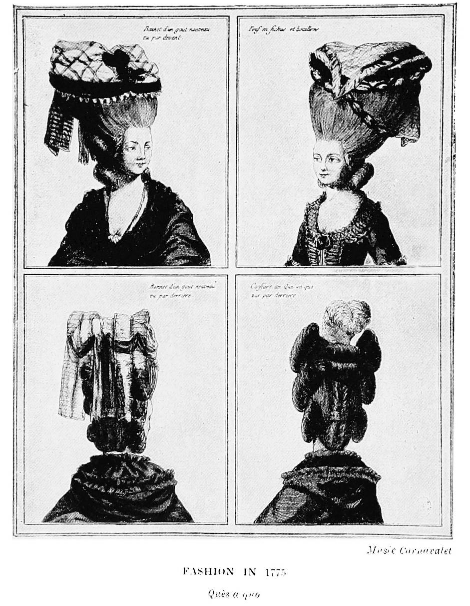 “It consisted of a panache in plumes, which the elegant ladies wore at the back of their heads.” The name Ques aco is supposed to have been taken from a memoire by Beaumarchais, directed against a certain Marin, whom the author had ridiculized. The memoire of Beaumarchais had an enormous success, and the expression of Ques aco became very popular. 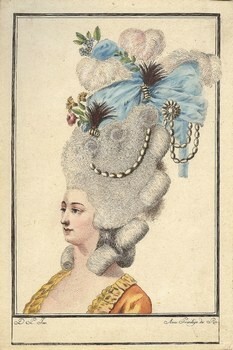 Marie-Antoinette had taken an interest in this event, the name of Beaumarchais being mentioned at Court very often, and she had asked for an explanation of the Provencial expression. When she understood it, she frequently happened to make use of it. Among her intimates, Rose Bertin, who was always au courant of big and little events, always in search of new ideas and new creations, and names by which to baptize the latter, was quick enough to make use of the incident, and soon imagined a new hairdress known as the Ques aco. Generally speaking, everything relating to fashion is of ephemeral character, but the headgears of those days were prodigiously so. Leonard Antid is supposed to have excelled in the art of placing poufs of gauze, which were introduced between the locks, and one day he employed for that purpose about 14 yards of gauze for one hairdress. But all these poufs differed greatly from the pouf aux sentiments owing to their simplicity; they also required no assistance from the milliner. The pouf aux sentiments could contain such various objects as fruit, flowers, vegetables, stuffed birds, dolls, and many other things giving expression to the tastes, the preferences, and the sentiments, of the wearer.